Hello folks and welcome back to the project where I create a real life deck, using whatever I have laying around, to add another deck to my burgeoning deck collection. I need more decks! One deck I’ve been looking at is based on an iteration in my Budget Commander series. Take a look at Surrak Dragonclaw. Now Surrak brings a lot of interesting thoughts to my mind as a leader. First of all, he has flash, so you can play your Commander any time you have the mana. That means folks have to respect him as on the battlefield even when he ain’t. They aren’t attacking into a naked board, they are attacking into your 6/6 Surrak, as one example. 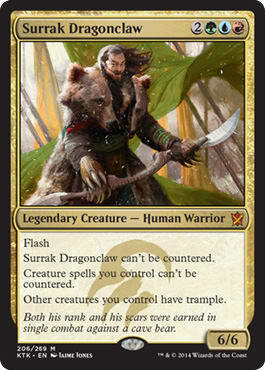 Secondly, Surrak is also an uncounterable creature, and also provides that to your team. It’s nice when the creatures you ramp to are guaranteed hits. I can also see a Surrak build with a bunch of strong, but annoying, utility creatures that you want to ensure arrive at the battlefield. 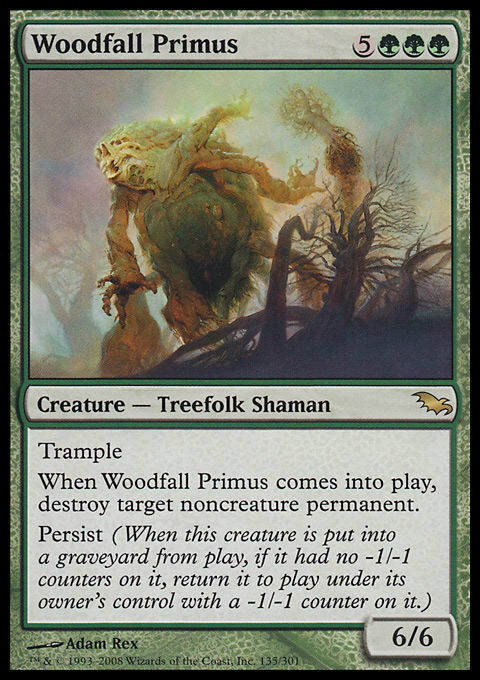 While cards like Solemn Simulacrum aren’t usually countered, stuff like Woodfall Primus or Consecrated Sphinx certainly are. Surrak removes one angle of attack against your forces. Don’t forget that flash and uncounterable combo. Suppose you play a creature in your main phase, with enough mana to drop Surrak. If someone casts Dismiss to counter your creature, you can just flash out Surrak, to keep their Counterspell from working. Finally, Surrak gives the team trample, so you can rely on looking at creatures that might normally have problems breaking through. Take a fire-breathing threat like Shivan Dragon. It becomes much more of a threat with trample. This is true of cards that you might normally slip past, like Greater Gargadon. Often it becomes chump-blocked instead of a major threat that an early 9/7 can otherwise be. With trample, the GG is going to stand for “Good Game” instead. Trample of your stuff helps to smash through defenses like Fog Bank, Commander Eesha, Wil-o'-the-Wisp, Darksteel Sentinel, and other dorks that jump in front of big beefy attackers with impunity. Surrak is an awesome tandem of value — trickery, guaranteed creatures, and trample to end the game. My budget build from about two years ago clocked in at about $35.00 worth of cards. Surrak plays into cheap areas since a lot of the smashes are on the cheaper side of life. But I really liked the trifecta of intersection that Surrak played into, and I want to push it further, including cards that were released in the year-and-a-half since. Now the fun part about this project is that we are only using the stuff I currently have, and I’m not raiding existing decks for cards for this one. Sometimes I’ll have more expensive or more recent cards that are perfect fits, and others where I just am missing cheap or great cards, because I’m not rocking them irl. That’s part of the fun of the project. That’s real life! This is going to be a real deck, with all of the struggles, foibles, and challenges that this project requires. So, what do I see for Surrak? There are three places where I what my Surrak Dragonclaw to go. The first is the old Naya mechanic of size. Naya, the colors of Green, Red, and White, had a strong Power-Matters mechanic. 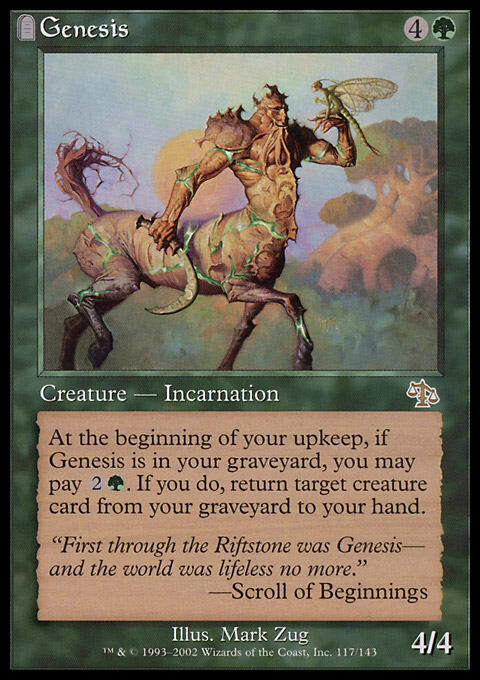 That mechanic worked for creatures with at least 5 power. Since Surrak interacts with Naya on two out of three colors, any Non-White Naya card can fit into a Surrak build. The second is the various help for the Beast tribe. Heading all the way back to Onslaught Block we’ve seen support for Beasts here and there. I want to push that support. That tribal deck was mostly in Green and Red, which, again, are the colors of Naya and Garruk. And then we have the Temur clan on the far side, with its love of the ferocious mechanic, one that’s enhanced by having a creature with at least 4 power on the battlefield. All of these cards work to tap into the same basic concept. Ideally I want Beasts with at least 5 power, but at all times, remember the smashery. Done! And that, my friends, is a Beast-tastic dose of Surrak lovin’. So you can see the Beast theme throughout, as well as a good solid dose of big stuff tossed in here and there. And since this is a real-life deck, let me show you some real-life pics! The next let’s drill into my creatures. Yes, that’s an Asian edition of Ravenous Baloth, signed by Arnie Swekel. Deck is locked and ready to rock! Now I wanted to pick up and break some stuff. Before I build the big creature suite, I want to ensure that I have the right stuff to play them. I looked at two major places to aid. The first were mana rocks and creatures we can drop to help us play the big guns we are rocking. The second is land fetching and acceleration of land drops here and there through the deck. The first is the best place to look. There are a lot of great cards that fit this theme, can be played early to slide under the big stuff, and help to bring that Beastly beater online a bit sooner. 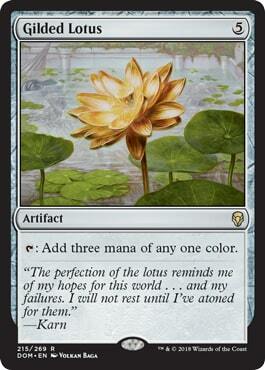 The mana rocks are obvious, Sol Ring, Gilded Lotus, and Darksteel Ingot all have obvious roles here. The mana creatures? That’s where we’re at. The best place to look is mana makers that actually fit the theme of big creatures united. Exuberant Firestoker is a 3-drop that’ll tap for a colorless mana and shoot people when you control a big enough creature. Drumhunter draws you a card and taps for mana as well. Both are great mana-makers and enablers for Team Naya back from Shards of Alara. There are other paths to hew in this vein from Tarkir Block. One is Rattleclaw Mystic, who taps for all of your colors, and can be morphed for a big boost of mana later if you need. Another is the common Whisperer of the Wilds. Drop it early to tap for a Green mana, and then later on you can early have the ferocious trigger to tap for 2 mana. All of those work in a big creature deck well. But the clear winner here is Somberwald Sage. It’s a 3-drop that’ll cast any 7-drop in this deck on turn four without any other acceleration, just one land a turn. You can use it to play a lot of your best stuff early and often, and is singlehandedly an amazing mana buddy for this deck at the same time. Because it taps for one color of mana, you can use it to fix your color needs too. If you like that, you can drop other similar creatures like Beastcaller Savant. Now layer cards like Sol Ring and Somberwald Sage along expected spells like Far Wanderings and Kodama's Reach. I also have a few tricks in here as well. Kiora, the Crashing Wave can be used for some card drawing and land dropping. Other similar tricks abound. Another way to deal with lands and mana needs is to draw a large amount of cards. You’ll get lands by default, right? And we have a lot of card drawing in here. Bident of Thassa? Swing and get triggers as you deal combat damage to players. With Surrak’s trample-giving fun times, that’s easy to do. And that’s not all! How about Shaman of the Great Hunt? It’s basically a Treasure Trove on legs. As long as you churn 4 mana through it, it’ll trigger off itself at least, to draw at least one card. 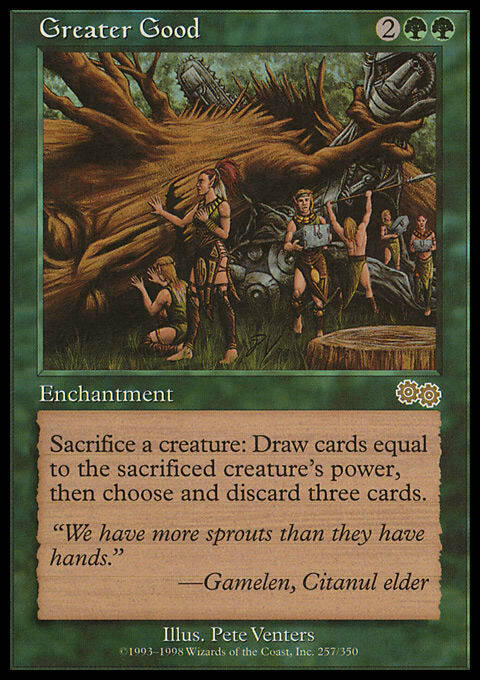 And you could easily pick up four or five cards per iteration. And it has a combat trigger to grow creatures as they smash face, so it slides right on in. And there are lots of other card advantage tricks in here. When Paleoloth is out, playing a big creature becomes a free Raise Dead. All three of the Planeswalkers I chose can draw you cards, from Domri Rade through Garruk, Primal Hunter form and its ability to draw cards equal to the power of something you have. And that’s not all! We have loads of other ways to draw cards that care about power or damage dealt — Hunter's Prowess. Life's Legacy. Hunter's Insight. The card drawing doesn’t stop. There’s an epic amount of card drawing here. It’s loaded with card drawing goods. So now that this is settled, what big stuff is rocking the block? Some stuff is obvious. 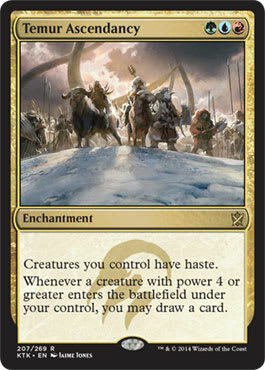 Krosan Tusker is big enough to play and trigger stuff, or you can cycle it for a card and a land. Whichever you need at the time. Creeperhulk is here to make your small stuff big enough to use with cards like Spearbreaker Behemoth. It’ll also change combat math in a lot of ways, plus when twinned with Surrak and getting them trample as well, it can end games quickly. Grave Sifter is here to reload your Beasts later on. 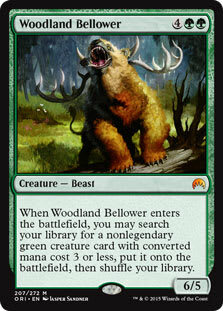 Check out Woodland Bellower. You can use it early to get mana acceleration like Somberwald Sage onto the battlefield. I like getting Fierce Empath as a fun alternative as well. I considered creatures that gave similar abilities to my stuff like Mosstodon and Spellbreaker Behemoth, but they are just a bit overly redundant to Surrak without adding anything new, so I decided to stick clear. The average casting cost of this deck is pretty high and I have to admit that up front. We have a few ways to alleviate the concern of having too many big smashing creatures. The first is the very random, fun, and old school Temporal Aperture. Shuffle your deck. Flip the top card – play it for free. Since you have a lot of bigger creatures here, flipping over a Spearbreaker Behemoth or Rampaging Baloths has a lot value. You can also toss out a strong spell. I don’t have any reactive spells in here, like countermagic, save for a few tricks like Aetherize. You should be able to get a land or something good from it every time you spin the wheel. I’m out of stuff like Defense of the Heart or Quicksilver Amulet, but those are interesting ways to look to advance playing creatures early. Shoot, I don’t even have a spare copy of Eldritch Evolution. Deathrender is another card in the “Drop a creature for free” strategy this deck likes. Equip it onto anything like a mana creature, and you can get the bonus, and then a creature folks will actively seek to avoid killing. They’ll fear you. Make it work! Another way this deck is self-aware is to have some pertinent Beast relevant early drops. Cards like Taurean Mauler and Trygon Predator are perfectly fine early on. Your Krosan Warchief comes out just before you begin to play Beasts, so its price reduction matters. 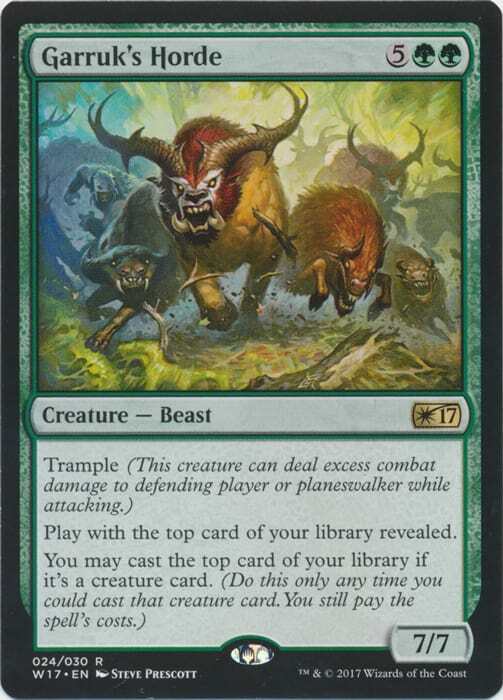 The same holds for Canopy Crawler as well, which can be played early, and then used to tap and pop up Beasts is a very alarming, pseudo Immaculate Magistrate. Lastly I wanted removal. Our deck wants to smash. So rather than run stuff like Chaos Warp, Reality Shift, or Fissure, I’m running fight stuff instead. Contested Cliffs, Domri Rade and such are here, but my favorite is clearly Gruul Ragebeast. I suspect it might be one of the best Beasts in the deck. I have Warstorm Surge here as well, for more damage-flinging fun. (Grab the Reins can be used as a Fling variant, or to steal a creature and then fling it at another). I wanted another piece of removal for all things artificial. So I tossed in Mockery of Nature. It’s another Beast, with the ability to Emerge and drop its play cost considerably. With a 6/5 body, it’s more than big enough for me. And that’s pretty much a Temur/Naya/Gruul mash-up of fun, power, and big creatures. Unleash that Timmy! 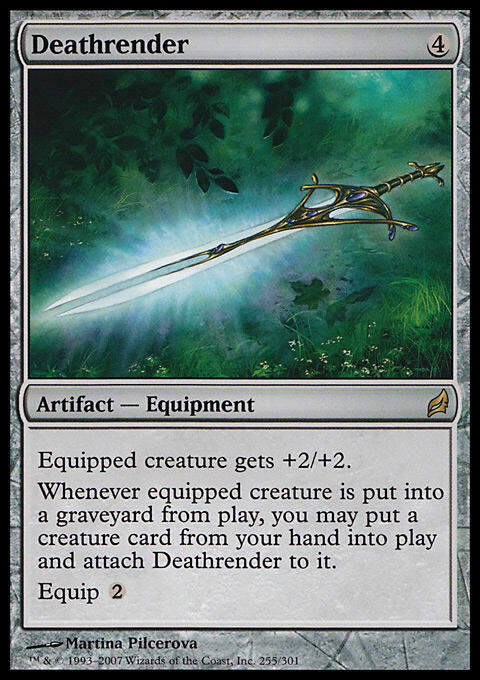 There are cards out there that I don’t have, cards like Aether Charge or Craterhoof Behemoth. You could look at Winds of Qal Sisma, Wirewood Savage, Shamanic Revelation, Atarka Pummeler, Circle of Elders, Spellbreaker Behemoth, Soul of the Harvest, Mold Shambler, Oxidda Scrapmelter, Batterhorn, Terra Ravager, Sphinx of Uthuun, Sphinx of the Last Word, Momentous Fall. Cards that I pulled, but which didn’t make the cut included Keldon Vandals, Lightning Greaves, Swiftfoot Boots, Xenagos, God of Revels, Jace, Memory Adept, Nim Deathmantle, Chameleon Colossus, Nissa's Revelation, Atarka Pummeler, Siege Behemoth, Thragtusk, Valley Rannet, Naya Soulbeast, Sylvan Caryatid, Zoologist, and Zendikar Resurgent. That’s a lot of depth for this concept, even missing some valuable cards here and there. I’m sure you can find some powerful stuff to unlock the majesty of your Surrak Dragonclaw! Hello folks! I need some help and I figured this was the right place to ask. I am looking at starting a blog that would require some bells and whistles. The quick run down is simple — I began this project 11 years ago. The goal was to create a dynasty that would be my magnum opus. My coup de gras. I’ve done a lot of gaming write ups in various forums and such for the past 15 years, and felt the blog would be the natural progression. Here's how I envisioned this project. I created a future science fiction universe set with a major character and set up. Then I would play through a variety of video games, set up by the chapters that I specifically wrote. With the idea that you could play these games at the same time, if you wanted, and be a part of this huge, cross-game, cross-platform, cross-genre epic space saga. I started, wrote the background info, and even knocked out the first few chapters. I wanted to have enough of a head start to ensure I had the momentum to succeed. But I haven’t touched the project in probably 4 years or so. It’s time. I started sharing the stuff I had written with some folks online to warm regards. So I wanted to see about bringing that to life. I’m sure some of you are tech savvy and can help me with the information I need to know about setting up, what’s the best site, what would the cost be for hosting the various sub-sties (I’m envisioning separate encyclopedias for various alien races, planets, starships, and people as well as hosting save games for people to download and boot up to follow along and that sort of thing.) and screen shots and more. And then I want it to be interactive as well, with the various posts in a blog-like manner having that ability for posting and responses and questions with the rules and such. That’s what I’m looking for. If you can help, or have info I can use, I’d leave to hear from you! E-mail me at euplatious@hotmail.com. Thanks thanks!